Which comes first, the service or the products that use the service? This is a business question, not a technological question. One of the uncertainties that communications industry professionals often express is the strength of the business cases and the deployment economics of 5G. While technology confidence is high, it’s not clear if, when, and how soon 5G deployment will stimulate new products and services that customers are willing to buy and subscribe to for their organizations. 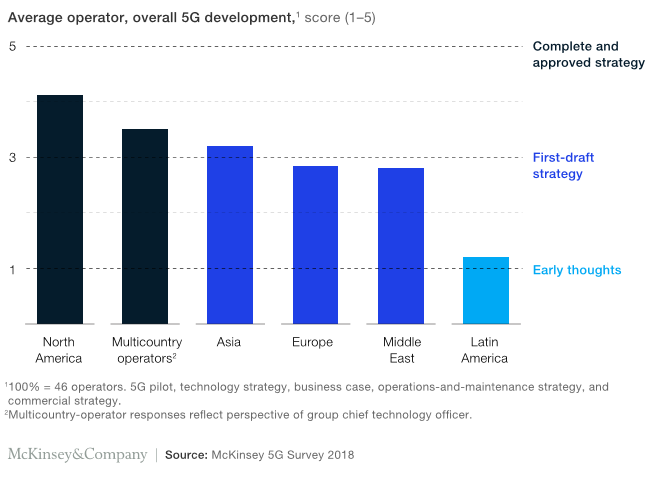 McKinsey & Company conducted a proprietary survey of 46 chief technology officers (CTOs) directly engaged in 5G-development plans around the world and issued a report titled, “Cutting through the 5G hype: Survey shows telco’s nuanced views.” The images in this blog are from the McKinsey report. Economics are not on the side of any wireless networks at present. Monthly average revenue per user (ARPUs) is decreasing (ARPU fell 7% in the U.S. in 2017) and data usage is increasing. Operators have decreasing revenues with little expectation that this will change. Making a business case for more investment when income is declining is tough. To deliver the full 5G vision would require a massive increase in cell numbers which would be hugely expensive -- and these efforts would be only to see revenues continue to decline. This is why operators from Europe to South Korea have said that they cannot see a strong business case for 5G. The U.S. hype surrounding 5G can lead to the conclusion that we are well on our way to deployment. 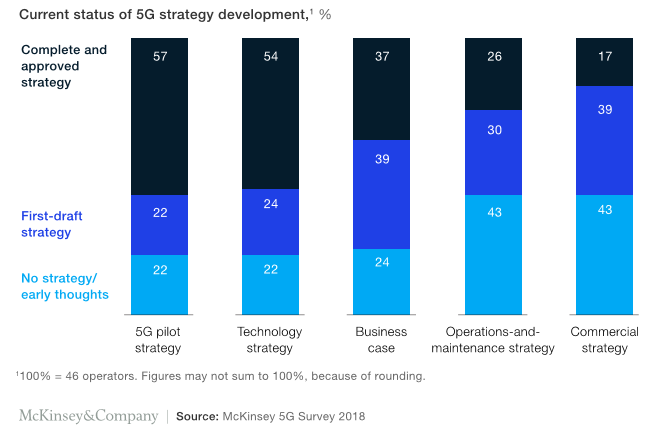 However, when you look at the chart below, you will find that the 5G pilot and technology strategies have moved along quite well, with over 50% of the respondents completing an approved strategy. If look to the right of the chart, you will notice that the business case is completed for about 37%. Operation and maintenance strategies are even less, at 26%. The weakest is the commercial strategy, at only 17%. This should be of great concern to those who want to adopt 5G. The commercial strategy is not completed. It’s difficult to determine where and when 5G is going to be available in the desired geographic areas. Will 5G be available at competitive prices? 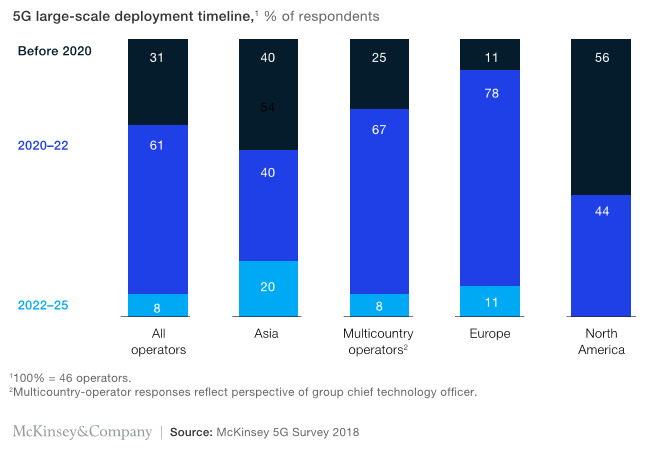 When you analyze the chart below, you will see that 69% of all operators in the world will not be deploying 5G networks until at least 2020. When you break it down, the Asian community is a little more aggressive, but still 20% say they will not offer 5G services until 2022. When you move to Europe, only 11% will be ready by 2020. Some European operators (11%) are anticipating offering services after 2022. Globally, the majority of the operators appear to be focusing on the 2020 to 2022 time period. North American operators are more aggressive. Fifty-six percent say they will be offering 5G services in 2020 and none of them expect to start offering services in the 2022 to 2025 time. This bodes well for those who want to operate in North America. It means that when you look at deployment calendar, 5G deployment will be much slower outside of North America. Vendors are predominantly driving deployment discussions, out of the hope for an increase in sales/revenue. Governments are also driving 5G in the hope for some benefits to internal industries and likely for political advantage through association with the latest high-tech idea. There is very little customer pull. 5G is a solution in search of a problem. 4G networks can offer many of the 5G capabilities today (see “5G v. 4G: A Different Perspective”). In the U.S., operators are also looking to 5G as a source of bragging rights, believing that showing 5G leadership helps with marketing which needs to be proven. China is perceived as the major U.S. competitor for 5G deployment, and Latin America operators are the slowest to deploy 5G networks. The business case is complex because most respondents believe 5G will produce increasing costs. Two-thirds of McKinsey survey respondents cited that the capital-expense-to-sales ratio will go up. Only 11% see 5G as reducing industry capital expense. Sixty-five percent of the surveyed CTOs expect site costs to increase, while 50% expect maintenance costs to increase. Forty percent of CTOs surveyed expect IT costs to increase, while only 22% percent expect IT costs to decline. The survey conclusion is that the respondents anticipate an increase in operating expenses, which hamper the revenue and profits for the operators. Learn more about this topic at Enterprise Connect 2019, coming to Orlando the week of March 18. Attend the Thursday morning session, “What You’ll Wish You Knew About 5G,” moderated by mobility expert Michael Finneran. If you haven’t yet gotten your pass for Enterprise Connect, register now to take advantage of the Early Bird Rate -- ending today! Use code NJPOSTS at checkout to get an extra $200 off!